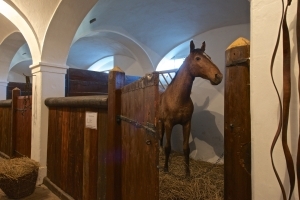 As soon as visitors enter the renovated underground stables, they find themselves in a completely different world: the exhibition is supplemented with animation and authentic sounds, so visitors can see horses, listen to their neighing, braying, the clip-clop of hooves, and the chirping of birds around... The exposition now also includes a newly restored star of racing tracks of the first half of the twentieth century, the stud thoroughbred Gradivo. In addition to the stables, visitors can also enter the chateau kitchen and laundry, have a peek in the ice room, cellars, and other authentic spaces which were part of service quarters of every aristocratic residence. In this way, visitors have a unique opportunity to form an accurate picture of life and work in the countryside and to appreciate the changes which took place in the course of the past century. Kačina stables embody a unique architectural design: they are an integral part of one of the colonnades of the chateau building. This contrasts with the usual location of stables, which tended to be located further away in a purpose-built barn on the grounds of an estate. Moreover, two thirds of the stables are sunk below the ground level, so that horses entered their stables directly from the park of the chateau, rather like cars being driven into a garage. On the way to the stables, horses passed through an approximately 30 meters long tunnel, which linked the stables with the entrance from the garden. The space where horses were stabled was pleasant: cool in the summer and warm in the wintertime. The stables include an original brick floor and stone drinking troughs. The stables could house up to fourteen riding and carriage horses. In the back part of the stables are closed boxes, which housed either more lively horses, especially stallions, or pregnant mares or mares with foals. Next to the stables is a coach house and a service building with a hothouse. The stables and the coach house had to be spacious enough to accommodate also the horses and carriages of chateau’s visitors. The stables served their original purpose until early 1930s, when Quido Thun Hohenstein, the last aristocratic owner of the chateau and nephew of the last Chotek, had to leave the estate. His extravagant lifestyle left him deep in debt and he lost the estate. Horses did not, however, disappear from Kačina and even in the 1960s, they were often stabled here for a night during the races.